The EI60 wooden fire door, while ensuring the required fire protection, may be used in aesthetically demanding interior designs. Advanced technologies allow us to deliver very diverse products: from simple, single-coloured fire doors typical of public buildings, through modern design doors for dwellings and hotels, to doors with unusual shapes and features intended for historical buildings. The 56 mm plain door leaf, featuring a thick 19/30 mm rebate along three edges, as well as the 60 mm glazed door leaf, featuring a thick 19/39 mm rebate along three edges are made of hardwood plywood stiles and rails and two layers of GKF plasterboard. Standard door leafs feature 6 mm MDF skins on both sides glued together with stiles and the core. Thicker skins are used when decorative elements are milled onto them. The EI60 door leaf is filled with mineral wool panel of 180 kg/m³ density and 44 mm thickness glued together with stiles and skins. Glazed door leafs feature 48/80 mm modules made of glued solid wood and GKF plasterboard layers that hold EI60 class 23-27 mm glass panes. Glass panes are held in place by steel angles and MDF beading and sealed using special fire resistant sealant and ceramic seals. Maximum size of glazing is 984 mm (width) and 2340 mm (height) with minimum width of 150 mm for stiles and top rail and 200 mm for the bottom rail, as per certification requirements. The EI60 fire resistant door technology enables the glazing to be replaced with solid 40 mm EI60-class panels consisting of layers of special fire resistant MDF panel combined with silicate panel and 180 kg/m³ mineral wool. Where the panel filling is chosen, its maximum size is 930 mm in width and 2360 mm in height. are normally mounted on 65/100 mm composite standard profile frames consisting of external HDF panels glued with fire-resistant plasterboard and plywood. Depending on the place of installation in the reveal the wooden standard profile frame may be provided on both sides with MDF angles in all sizes, architraves and beading finished to match the frame. In the EI60 door sets the visual effect of a wooden wrap-around frame is achieved by fabricating a wooden standard profile frame matching the thickness of the wall and, after its installation, attaching angles by inserting them into special grooves machined on both sides of the frame. Angles, architraves and beading, apart from the aesthetic effect, have also an important practical meaning; by covering the contact point between the frame and the wall they allow you to complete a turnkey installation without plastering, primer coating and painting of the reveal. The EI60 wooden fire door set may be also provided with steel door frames ready to be set in concrete; the door frames come in three different designs: with single overhang, standard profile and wrap-around; all frames are manufactured from 1.5 mm moulded galvanised steel with a seal groove along the three edges. The EI60 fire door with wooden door frame comes with 2.5/15 mm intumescent fire resistant seal set in the frame. The intumescent seal is set in a groove running along the door frame to protect the seal against accidental damage; for aesthetic reasons the fire resistant seal may be hidden from view by setting it under the door frame finish. In the EI60 wooden door with metal door frame the 2.5/20 mm intumescent fire resistant seal is set in a special groove machined along the three edges of the door leaf. Wooden fire doors with wooden frames may be set in wooden fire walls constituting a uniform whole in terms of style and colour. Depending on the size and weight of door leafs the EI60 wooden door sets come with adjustable steel hinges, 3 or 4 per door leaf; optionally, one of the hinges may be replaced by a dog bolt mounted in the leaf to prevent jemmy attack. Standard door furniture: a lock and latch set with stainless steel faceplate, multi-point locking system in door leafs taller than 2500 mm, and cylinder lock with a set of three keys. U-form stainless steel handles with escutcheons. The double fire door comes with top and bottom bolts on the passive door leaf, or an automatic latch when the door is synchronised by a closing order control device. Positive sealing at the contact point of the active and passive door leafs is ensured by an MDF astragal. 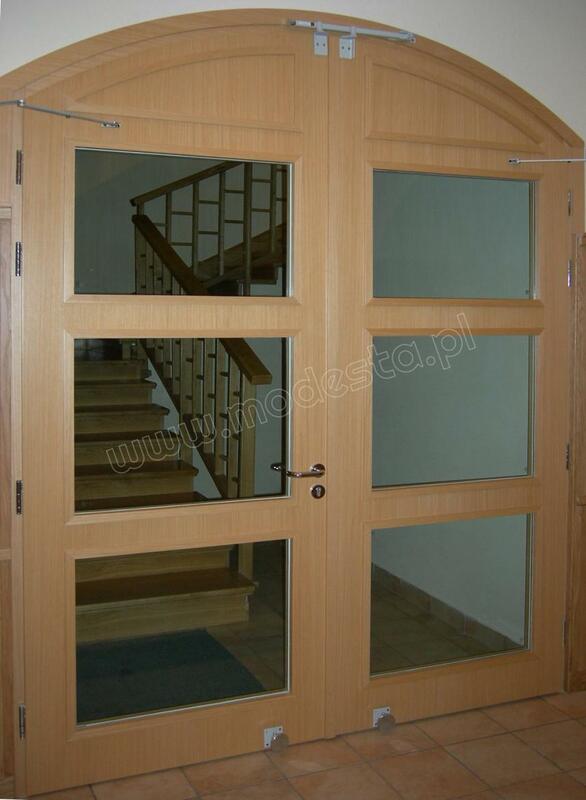 stipulates that the door may be installed without a threshold or as a smoke resistant door. Fire and smoke resistant door leafs come with an automatic drop seal at the bottom edge and a perimeter V-seal around the top and lock edges. 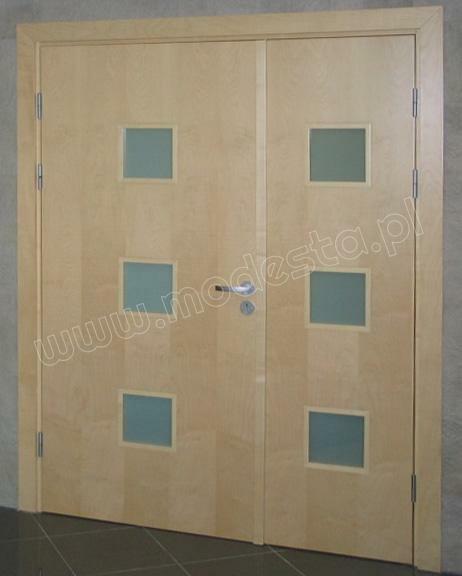 Smoke resistant double door also feature additional K-seal on active and passive door leaf astragals. The wooden fire door design allows you to install also an oak, mahogany or beech threshold with a seal; alternatively, a steel threshold with a seal may be installed. may consist of natural wood 0.6 mm veneer or 0.8 – 1.0 mm HPL laminate. Natural wood veneer, as required by the designer, may be painted, stained, painted with transparent varnish or painted with a single RAL colour with or without visible wood texture. Due to the rigidity of the HPL laminate it is applied only to door leaf faces; the other wooden fire door set elements, such as door frames, leaf edges, astragals and beading are finished with natural wood veneer matching the laminate. Apart from its decorative properties, the HPL laminate significantly improves the resistance of door leaf faces to abrasion and other mechanical damage. Steel door frames of fire door sets can be powder coated in any RAL colour. The MDF used for skins allows you to embellish the door leafs with decorative battens. 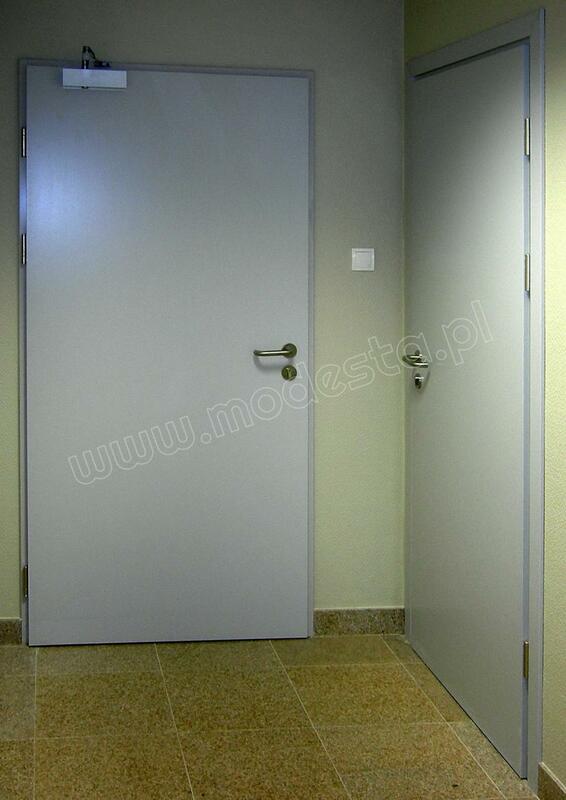 The single fire door may be delivered with an over panel made of wooden frame and GKF plasterboard. The over panel is filled with dense mineral wool, and its skin is made of the same MDF as the skin of the door leaf. The over panel is 56 mm thick and its maximum size is 1236 mm (width) by 820 mm (height). allows you to use the wide range of non-standard door furniture making the door sets perfect for comprehensive, state-of-the-art, demanding projects. The EI60 wooden door may be equipped with EI60-rated fire block ventilation system, maximum size 600x200 mm (fitted in doors without the smoke resistance function), as well as with kickplates along the bottom edge and pushplates at the handle height made of steel or an additional laminate layer. For ventilation louvres the same minimum stile and bottom rail widths apply as for glazing. Fire block vents are covered on both sides with perforated sheets of stainless, or powder coated in any RAL colour, steel. Optional door furniture includes also evacuation locks, panic equipment, access control equipment working with the main or an additional lock, Ø16 mm fire resistant spyhole, hydraulic closers, electromagnetic door holders and automatic opening and closing equipment.